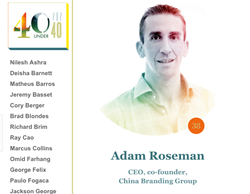 Adam Roseman, CEO & Co-Founder of FansTang, China's #1 Western entertainment digital content company, has been named to Ad Age's 40 Under 40 list in recognition for his achievements in the marketing and advertising industry. Adam Roseman, CEO & Co-Founder of FansTang has been named to Advertising Age’s 40 Under 40 list. Roseman co-founded FansTang, wholly owned by its parent China Branding Group, a digital media firm specializing in China’s burgeoning demand for localized international content, in 2012. As the CEO, he heads the Los Angeles-, Beijing- and Shanghai-based teams that have chartered countless new territory in Chinese and Western entertainment content collaboration, including developing and producing China’s most watched Hollywood news and celebrity interview show, being the first international content business to localize and stream major awards shows and other live events into China, and producing the award-winning branded content web series for Coca-Cola China’s 2015 summer marketing campaign, starring Western celebrities in online viral videos supported by an extensive social media campaign on Chinese social media.